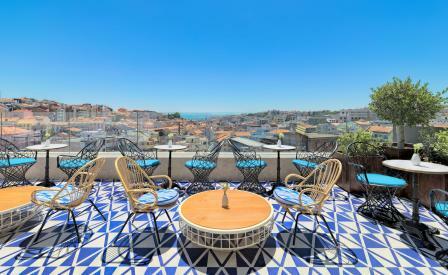 Spain-based H10 Hotels opened its first Portugal outpost this year with H10 Duque de Loulé, an 89-room boutique property shaking up Lisbon’s financial district, which until now has been the stomping ground for traditional business accommodations. Designer Lázaro Rosa-Violán - whose exhaustive list of projects include Cotton House Hotel in Barcelona - took inspiration from Iberian handicrafts, in particular azujelos, the decorative tiles found all over Portugal, to swathe the converted 18th century convent in a blue and white palette. Working with artisans from the peninsula, Rosa-Violán adorned traditional elements such as wood-panelled ceilings and dramatic period portrait tiles with contemporary furnishings from studded wingback velvet chairs to graphic black and white illustrations and dramatic light fixtures throughout. The highlight however, is the Limão rooftop bar terrace; located on the 10th floor, the sculptural wire-back chairs set the scene for a cocktail break overlooking the terracotta roofs of downtown Lisbon.